A transport firm has named its new executive coaches after the children and grandchildren of their drivers. 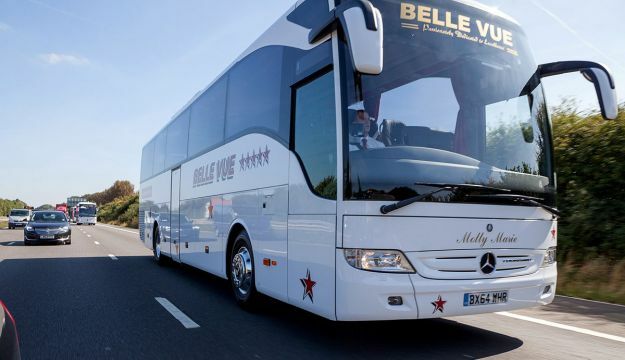 Belle Vue Manchester took the unusual step after taking delivery of five 49-seater Mercedes-Benz Tourismo coaches, which are used for day trips, holidays and continental tours. The youngsters’ names have been painted in gold on the front of each vehicle. The coaches, acquired by the Stockport-based company at a total cost of £1.25m, are named Jack Benjamin, Molly Marie, Cody Louie, Janet and Heidi. Jack Benjamin Fielding, aged three, is the grandson of Belle Vue drivers Vivienne and Mike Harrison. Molly Marie Burrows-Gill, aged two, is the youngest child and only daughter of Robert Gill. Cody and Louie Mulcair, aged 18 and 13 respectively, are the granddaughter and grandson of John Gilbody. Janet Moreira is the nine-month-old daughter of Luis Moreira. Heidi James-Howell, aged six months, is the granddaughter of Ken James. Belle Vue director Phil Hitchen said: “Originally, we were thinking of naming the coaches after north west landmarks, but we really liked the suggestion by our maintenance director Ken Walsh to invite the drivers to choose the names. He added: “We have a fleet of 48 Yellow school buses operating across Greater Manchester and 22 vehicles operating across the UK and Europe but, despite our size, we are still a company with a human touch and a family feel.“We have numerous husbands and wives, fathers and sons and daughters, nieces and nephews working in the company. Ken James said: “It’s brilliant to have my granddaughter’s name on the coach, it’s really special and something different.” The names have become a major talking point with passengers. The new coaches are equipped with air conditioning, luxury reclining seats, foot rests and fold-out trays as well as 19in TV screens, wi-fi and an on-board toilet. Belle Vue’s fleet has increased to 70 with the recent arrival of five new Optare Versa Hybrid School buses, two corporate coaches and a vintage double-decker.